So this post is just going to serve as a how things are going and what to expect from me in the near future. Because I’m writing… A LOT! All my books are now back under my control. I am once again completely self published! I feel there should be some fireworks here. 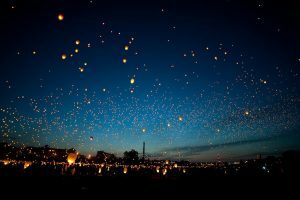 OK, I went with sky lanterns instead because they’re prettier. The Ties that Bind and The Bound Folio are all re-released and selling again, new covers and all. And Where Loyalties Lie is FINALLY out in the world. Not just out in the world, but also entered into the 2017 Self Published Fantasy Blog Off (SPFBO). Fingers crossed it does well, but it’s in Fantasy Book Review’s group and there is some fierce competition in there. Whether it proceeds to the next round or not, I’m just happy that my piratical tale is finally out in the world for people to read. 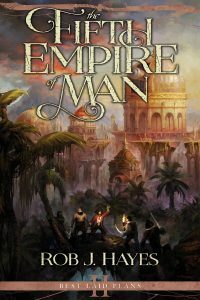 Well next is The Fifth Empire of Man, the second book in my piratical duology. Time to show off the cover. The Fifth Empire of Man is releasing on September 26th of this very year, and concludes Best Laid Plans. Believe me when I tell you it ramps up the tension and action from the first book, but keeps the gallows humour. I’m fairly certain most people will be pleased to know that Elaina Black and T’ruck Khan get much larger roles in this one. And for fans of The Ties that Bind, there’s a brief stint in the Wilds and a catch up with Black Thorn and Rose. Later in the year, probably November or December time, I am hoping to release Drones. This book is a sci fi noir thriller set in a world where emotions can be harvested and sold. I’ll be getting a cover and blurb sorted soon, but one release at a time and all that. Moving on to 2018 I have City of Kings written and ready. This is another First Earth book and follows on from the events of The Ties that Bind as Thorn and Rose attempt to rid the Wilds of the blooded once and for all. It’s all set around the siege of Crucible, and it is wall to wall action and chaos. This one earns its grimdark brand, and no one is safe from the chopping block. After that we’re in to unknown territory. I’m currently working on a YA-ish fantasy series I’m calling The Source of All Things. I’m two books in on that and I’m planning it to finish at four. But I’ve taken a quick break from it to write a stand alone eastern-inspired fantasy called Never Die. As yet I’m not sure when I’ll be releasing these ones, but you can expect at least two books from me in 2018, three if I’m feeling frisky. 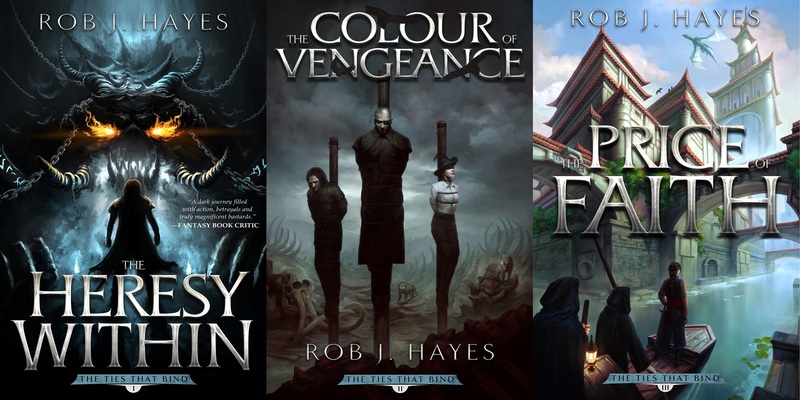 So that’s about it with where Rob J. Hayes is right now and what you can expect from me in the coming year. I will be writing and fingers crossed you will all be reading.